Unfortunately this program has been suspended until we can find a suitable way to make it work. You can still join Little Dribblers on the weekends at the links below. Come and join us in our latest midweek footy program! Join the hundreds of kids that have already received a Little Dribblers visit and come to a session of great fun, development and more! Due to the growing interest in our midweek Little Dribblers sessions we decided to start running weekly casual gatherings for parents, kindys or groups that want to take their kids for an outdoor football day. Every Tuesday, Wednesday and Thursday from 10.30 we will be having heaps of fun running different drills, exercises and games! Have a look at the different age groups and times and come down and have a look! The FIRST SESSION IS FREE! If you like what you see, then register and keep coming! The cost is $5 per session and kids get a 30 minute session of basic fundamental movement skills, working together in teams, listening and following instructions, playing games and more. And all of that while you can relax and have some coffee. 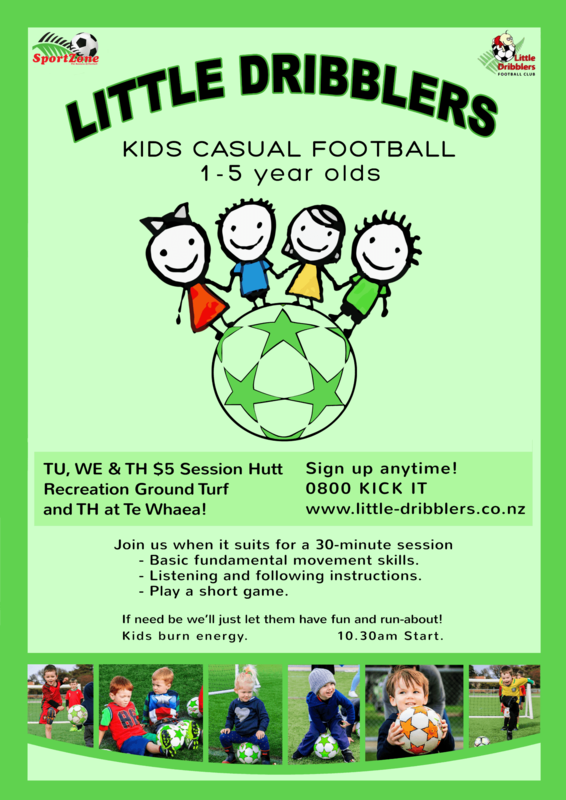 This will happen every Tuesday, Wednesday, Thursday at Hutt Recreation Ground Artificial turf (Bellevue Road entrance), starting at 10.30am. In the Gym if its raining. We're also at Te Whaea (Hall St entrance by Junglerama) on Thursdays. Don't miss out, join the fun! If you've enjoyed what you've seen, don't hesitate, REGISTER HERE! If what you're looking for is our usual weekends Little Dribblers, click HERE!